← The Mason’s Lady News! Halloween is coming up, so I figured now would be the perfect time to discuss some Masonic costumes. Not for Halloween mind you, we will save that for next week, but the traditional garb worn by Masons and other affiliated organizations worn at meetings or for other purposes. Please keep in mind that many of these outfits are only worn for special occasions, or not at all, these are simply the traditional outfits. You may see other garb worn at Lodge, Scottish or York Rite, but these are usually only used for degree work, and then, usually only during special times (competitions, full form degrees, and the like). Also know that many Lodges or chapters may not have access to the extensive costumes that others do. I know that many of the costumes kept at our Scottish Rite have been around since the 1960’s or even earlier, most are hand sewn, and since they tend to not be used very often, they are for the most part in very good shape. If you ever get a chance to see a Masonic costume room, I highly recommend it. There is a large variety of costumes, and the amount of time and work that went into making them is astounding. This is the costume or outfit that you are most likely to see, although usually a more simplistic version. During Lodge, a Mason will wear an apron that is either plain white, or has the symbol of his office on it (if he is an officer) unless he is taking his Entered Apprentice degree, in which case he will wear no apron at all, until he is presented with his lambskin apron. The apron is a symbol of the purity of life. In addition to this, officers will also wear the jewel of their office, simply the symbol of their office on a cord. You can read more about the symbols of the offices here. 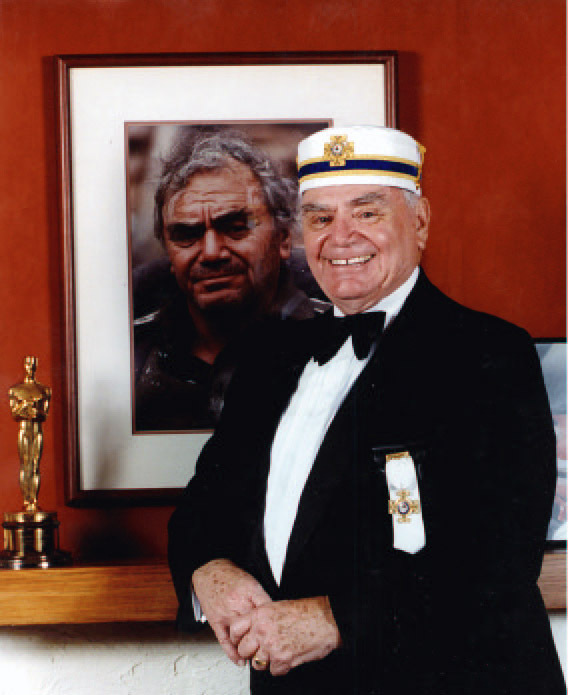 The picture above is that of a member of the Grand Lodge, someone who holds a state office. The only difference between a Grand Lodge officer and a Lodge officer’s garb is the degree of ornateness. The Grand Lodge aprons and jewels are often very showy. In Canada, the aprons may be red and gold instead of blue and gold. As T just eloquently put it, “The fez is the apron of the Shrine.” You will not ever see anyone wear both an apron and a fez, and in fact, in cases where both would be appropriate, the apron supersedes the fez. As I have discussed before, the Shrine was inspired by a play set in the Middle East, and incorporated many components of that into its ritual and other work. The fez takes its name from the holy city Fez, Morocco. Like Blue Lodge Masons, Shiners also wear a jewel of office. These may be on a cord, as in Blue Lodge, or on a pin, as shown here. Often, an officer will also receive a fez that has the title of his office, in addition to his plain fez. Royal Arch Masons within the York Rite rock the red jacket and apron. 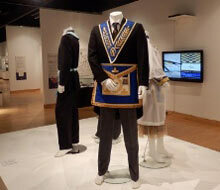 Other than that, the idea is the same as Blue Lodge, jewel and apron of office when appropriate. Shown is a member of a local Chapter. Cryptic Masons within York Rite also follow the same garb laid out by Blue Lodge, although they use purple instead of blue. Again, same general idea. Shown is a member of a Grand Cryptic Council. The Templars easily have the coolest Masonic costume outside of those used for degree work. The big fluffy hat is called a chapeau, and all members receive a sword during their initiation. All of the swords are silver or steel, except for the Commander’s (Templar equivalent of WM), which is gold. Crosses are used throughout the costume, as a requirement of joining the Templars is a belief in Christianity (or at least a willingness to fight for them). The entire outfit provokes thoughts of the military. The entire outfit replaces the apron. There are over 15 different hats worn within the Scottish Rite, all symbolizing different degrees and statuses. The two you will see most often however, are the 32nd and 33rd degree hats. The 32nd degree hat is shown above. Often, aprons are not worn at Scottish Rite meetings, except for degree work, and even then sometimes the candidate is the only one who finds himself in one. This may vary from Consistory to Consistory of course. Unlike other appendant bodies, the hat and the apron may be worn together. 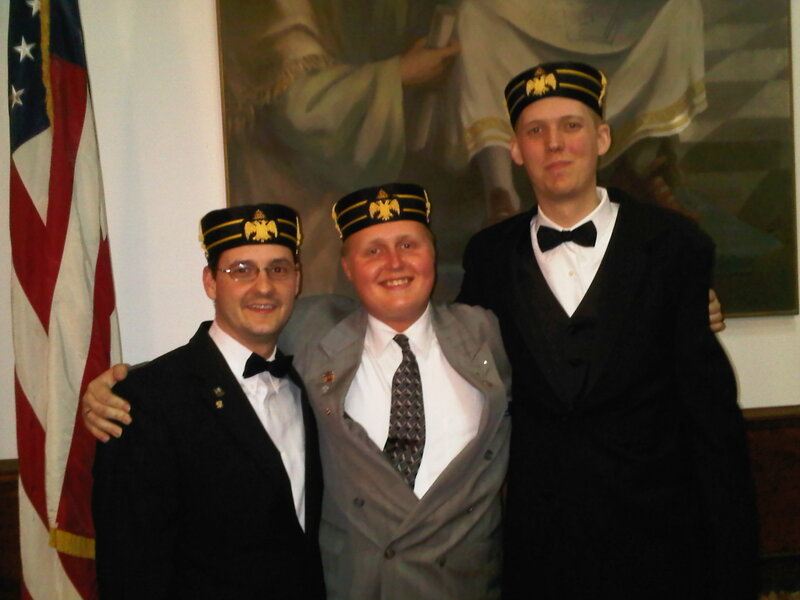 There are many different variations on the 33rd degree hat for Scottish Rite, but it will always be white. Many other hats exist for the Scottish Rite, and they vary greatly in color, ornateness, and jurisdiction. They are, however, generally all the same shape. Many other Masonic costumes exist out there. Job’s Daughters has a traditional gown, Rainbow has a color system for their courts. DeMolay has a traditional outfit as well, and it includes a cape! In addition to these, there are countless outfits for degree work, which are usually not used too often; alas, that is a different article altogether.